Hi folks! It’s been a while, and even though I should be working (right this second, actually) on a draft analysis for my dissertation (more on that at the end! ), I am here, writing on my blog because it has been way too long… and I miss it!! Last week was a crazy roller coaster! It is safe to say it’s been that way since I started the program, but amazing things have happened and I’m eager to share. So yeah, last week I gave my first talk ever (YAY!) with a sweet, amazing and intelligent colleague of mine (Hi Bethan!) about the importance of language in our everyday interactions as outsiders and insiders of the LGBTQ+ community. We were invited to do it as one of the events of LGBTQ+ History Month at the University of Birmingham. I must say it went great! We had a lot of positive feedback, comments and a discussion at the very end of the session. 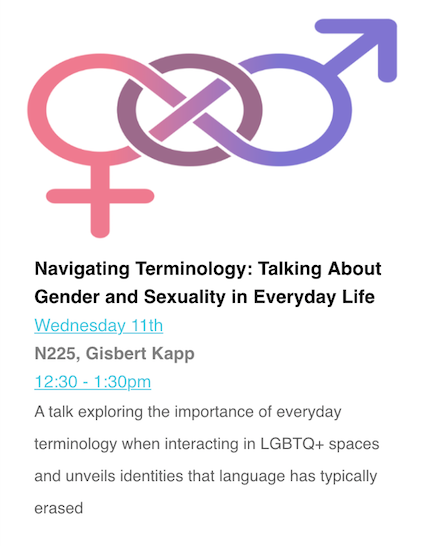 The talk focused on bringing sexualities and genders that have been traditionally erased from everyday language, imaginary, and activism – bisexualities (or, better, non-monosexualities), trans genders, asexualities, and intersex. Yeah, they are all plural because I am by no means universalising the experience of all of these folks. To do this, we explained the intricate ways privilege and oppression works to make these invisible (through monosexism, cissexism, the gender binary, the sexual binary and so on), we mentioned the importance of their recognition and presence within the community. I really loved the discussion, especially at the end about sign-language and its limitations for expressing and talking about non-conforming genders and sexualities. Last week we also got our first grades back… boy was I nervous! It went really well though and I am happy, I worked SO hard for that paper. It is a big leap from undergraduate to postgraduate, especially a masters in research as I am doing. There are a LOT of expectations that can be terrifying when it comes to analysis and writing and so on. My paper explores binormativity in contemporary american media representations of bisexuality, using Callie Torres from Grey’s Anatomy and Oberyn Martell from Game of Thrones. I really enjoyed writing it, I can share some of it here (not textually) sometime, not right now lol 🙂 let’s see where it takes me now. Yeah, now on to other projects! 1. I have to hand in another essay on April 29th. 2. I have to hand in my literature review on April 29th. 3. I have to hand in a mock PhD proposal on April 29th. yeah, on April 30th I will sleep for 12567753 hours straight. This is pretty much the reason why I haven’t written here this much. Since September time has flown by and well, I love that this blog is about concise topics and analysis, I can’t do that right now, at least until April 30th hahaha. But, to keep it up to date I will either do micro posts of things I find interesting, things related to my work, or just little updates like this. That’s all I can do for now, I hope this is okay with all of you.